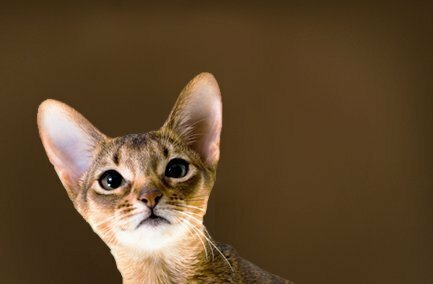 The overall impression of the ideal Abyssinian would be a colorful cat with a distinctly ticked coat, medium in size and regal in appearance. The Abyssinian is lithe, hard and muscular, showing eager activity and a lively interest in all surroundings. Well balanced temperamentally and physically. Coat colours: Ruddy, Red, Blue, Fawn. These playful, energetic cats love to climb and are very attached to their owners. Their ticked coats are unique to this breed. Renal failure rate for Abyssinian cats was identified to be more than double the baseline rate in a study of cats seen at veterinary colleges between 1980-1990. For this reason, we like to closely monitor their renal health with baseline blood work and ongoing monitoring.